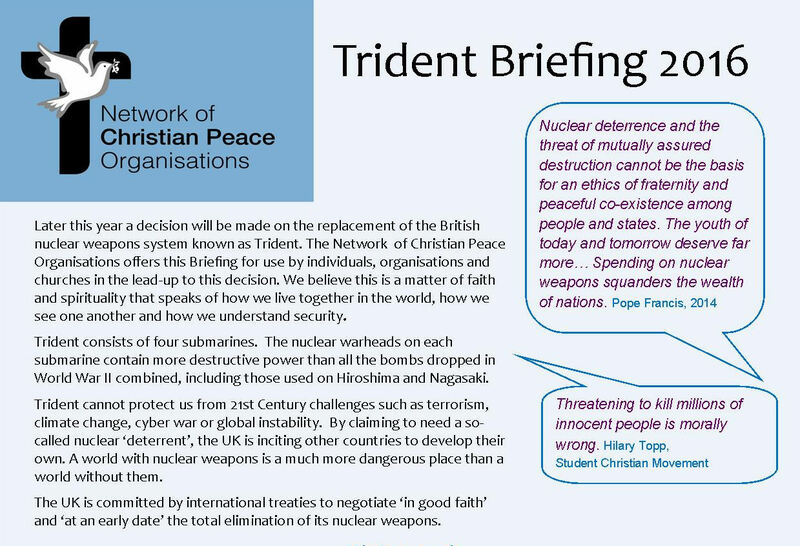 Resources to help make the case against Trident renewal and nuclear deterrence. 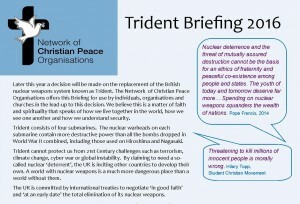 A new nuclear abolition resource was launched last week in Vienna by Religions for Peace at its assembly of 600 religious leaders. Nuclear weapons pose an existential threat to humanity, say religious leaders and believers must act to bridge the political divides that fuel the nuclear arms race. 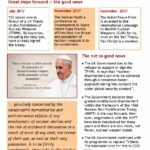 I would like to develop my reflection on the topic under three sub-themes:First, the Popes and the constant call for the abolition of nuclear weapons; Second, Pope Francis and the Humanitarian Impact of Nuclear Weapons; and Third, Some Elements of the Holy See’s call for nuclear disarmament…. ” Nuclear deterrence and the threat of mutually assured destruction cannot be the basis for an ethics of fraternity and peaceful coexistence among peoples and states. The youth of today and tomorrow deserve far more…Spending on nuclear weapons squanders the wealth of nations. To prioritize such spending is a mistake and a misallocation of resources which would be far better invested in the areas of integral human development, education, health and the fight against extreme poverty.